Since 911, I’ve looked into the USA’s own “terrorist” past and discovered many precedents that our Founding Fathers themselves created in the 1700s. Similar in scope to uprisings (i.e., intifada) like the Hebrews against their imperial Roman rulers, men like Paul Revere, Samuel Adams, and John Adams became the upper and middle class “leaders” of their own form of uprising against their own imperial rulers – the English King and Parliament. More like the Earth Liberation Front’s tactics than Al-Quida’s, our own Sons of Liberty worked their colonial rulers over via strategic use of violence, intimidation, and, well, terror. Along with a strong propaganda campaign, the Sons of Liberty incited riots, set fires in the streets, trespassed upon and burnt English property, and eventually tarred and feathered those that were loyal to the crown. I ran across this plaque in Providence on Wednesday. This caused me to reschedule my Thursday plans to try to find more spots where the Sons of Liberty conspired and acted. Most Americans only learn of the Sons of Liberty’s most spectacular agitation: the Boston Tea Party. Having a BA in History, I still knew little about this secret organization of decentralized terror cells, so took the time to look online for more information about them. 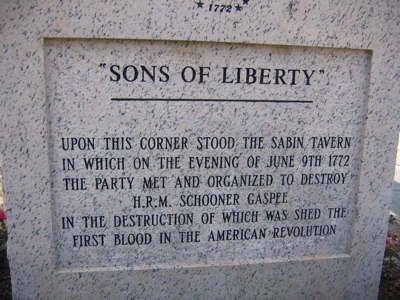 Comprised mostly of the “rabble,” and even organized by poor tradesmen, many of the Sons of Liberty’s freedom fighters will never have their stories told. Starting almost simultaneously in New York and Boston, groups of protesters took the name “Sons of LIberty” in all 13 English colonies. Much like the activist groups that have developed since the 1999 Seattle WTO protests, the Sons of Liberty met secretly and plotted creative forms of civil disobedience across the land. Copycat cells also sprung up in many areas, admitting to acts against the crown, while the press used the term to blame someone for incidents that had no known instigators. Somewhere in this huge mess of construction, rests the filled in Griffins Wharf, original location of the Boston Tea Party. 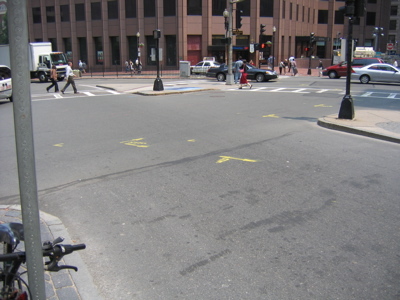 This spot isn’t on the official Freedom Trail, nor was it marked like the Revere House employee told me. No map shows its location, and I chanced across a reference in the park across from the Revere House. 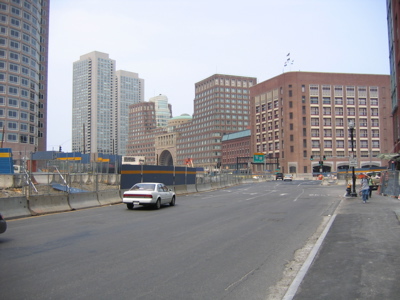 Sadly, one of the most outrageous stunts of our prenational history obscurely resides under a new interstate at Atlantic St. and Seaport Blvd. Amazingly, the more active period of the Sons of Liberty movement took place in the 1760s, protesting the Stamp Act. But the Providence, RI Sons of Liberty cell, after sinking the H.R.M. Gespee in 1773, took the credit for being the first seditious act against the English that caused bloodshed. They wounded the ship’s captain when they instigated the treasonous deed. Even later, until the 1780s, groups taking the name continued to fight the English and help the colonies gain freedom. While I toured Boston’s Georgian sites, sometimes skirting the inadequate Freedom Trail walk, I kept thinking of two issues. First, if the Sons of Liberty functioned in 2006, the US government would brutally squash their vibrant, appealing tactics. Much like the crackdown on the ELF, as well as the intense police states that have protected the GOP, WTO, G8 conventions, the Sons of Liberty would end up Enemies of the State rather than the grassroots, democratic vanguard. Secondly, the common men and women who took the revolutionary fervor over the tipping point in the American colonies will most likely never get their due in the annuls of history. Instead, the martyrs of the Boston Massacre, and the richer “organizers” of the Sons of Liberty, will be the subjects who tell the brief story of our prenation’s most violent, outspoken, and extremely creative organization. Making the terms freedom from the crown an appealing notion, these grassroots organizations took their desire to the streets. They destroyed property and broke laws, to move their agenda forward. Artists, workers, poor, rich, the Sons of Liberty continue to resonate with those who see the wrongs of their rulers – elected or not. This is the location of the Boston Massacre, where five commoners died while rioting against the English redcoats. Used as effective propaganda, these martyrs remain an important part of the history that most Americans learn. The fact that they were “rabble” that were throwing rocks and oyster shells at the soldiers is usually downplayed, as well as the actual location of the protest. The Freedom Trail doesn’t mark this event on the modern streets of Boston and leaves things vague on the simple map it offers. 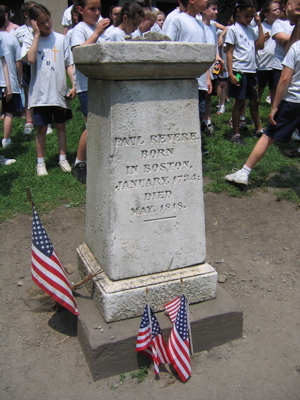 School children visit the grave of Paul Revere, an artist, founding father, and member of the Sons of Liberty. Many fail to remember that he may have been one of the “Indians” who dumped English corporate tea into the Boston Harbor. I lunched at the Green Dragon Tavern, “the headquarters of the Revolution” according to Sam Adams, Daniel Webster, and Paul Revere. 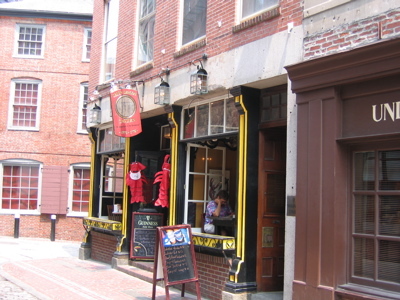 This was a frequent meeting place for the Sons of Liberty,who also met at the Liberty Tree and the Bunch of Grapes Tavern. The two latter locations no longer exist, and this Green Dragon is a replica that was rebuilt in a quaint conglomeration of really old pubs that skirt Scollay Square.